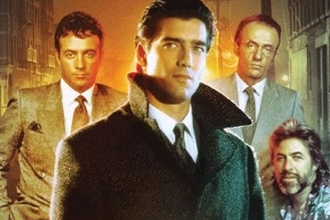 Vincent Terranova (Ken Wahl, who acted with Paul Newman and received praise for his natural acting ability) is an agent in the (fictional) organized crime division (OCB) of the FBI. He’s young (just 30 y.o. at the start of the show), a first generation Italian-American (who can actually speak Italian), and from working-class Flatbush, Brooklyn. He’s very proud of his heritage and community. Being very close to his family, they are an integral part of the show; older brother Pete (Gerald Anthony) is a local priest; his mother (Elsa Raven) is a widow in somehwhat fragile health. We learn later that Vinnie’s father was an honest man all his life; he drove a bread truck, never succumbing to the tempation of easy money, crime, and so on. In the 2 hr. pilot, Vinnie is released from Newark State Pen after 18 mos. He’s earned the rep of “wiseguy,” but this disturbs him deeply because his mother refuses to see him. When he angrily asks his superior officer Frank McPike (Jonathan Banks) why he had to do the full sentence, McPike points out that it had “to look real.” He’s now supposed to go to his first undercover assignment, but Vinnie insists on time off. Suddenly, Vinnie’s traning officer is murdered by the older brother of Atlantic City Mafia leader Sonny Steelgrave (Ray Sharkey). This propels the agent into action. Vinnie uses his wit, natural bravado, and boxing skills (he’s a former Golden Gloves fighter like Sonny) to win the respect of the mafioso and enter a new world (“terra nova” translates directy to “new land”). Sonny decides to take him on as a driver and gives him a huge penthouse suite in one of his hotels. Vinnie (ideally) calls Lifeguard (Jim Byrnes) every morning with the latest updates on the case, and is provided with quick news from the OCB side. Lifeguard also, under the name of Mike Terranova, provides Vinnie with an emergency contact number without revealing Vinnie’s true identity. (The cover location is “Sailor Hardware”; the codephrase “Uncle Mike” indicates an emergency request for assistance). As Vinnie rises within the organization, he (naturally) grows very close to Sonny, a man who has a lot of charm and some admirable qualities, despite being a criminal. He’s not a cartoonish villain. Eventually, Vinnie becomes Sonny’s right-hand, then a “made” man. The internal conflicts of the protagonist and the murky gray area in which he operates make Wiseguy very compelling.